Early on in Pokémon GO, you’re asked to make a decision: Which team do you want to be on? Instinct (Yellow)? Valor (Red)? Mystic (Blue)? The question comes a bit out of the blue. Especially amongst those who started early and have stuck with the game, it’s not uncommon to hear people grumble about how they wish they’d chosen differently. But once you choose, it’s final; changing teams means making a whole new account and starting the grind from Level 1. Well, until now. Pokémon GO will soon let you change your team by way of an in-game “Team Medallion” item. Realizing that there are too many Mystic in your area and want to mix it up a bit? You can switch to Valor. Are most of your friends Instinct and you want to help them hold gyms? You can. But there are catches: It’ll cost money, and you can only do it once a year. It’ll cost you 1,000 Pokécoins — that’s the in-game currency, (slowly) obtainable by holding in-game locations or in exchange for real money via in-app purchase. A pack of 1,200 coins currently goes for $10, so 1,000 coins works out to a little over $8. As for why there’s a once-per-year cap? It helps make sure people have some degree of loyalty to their chosen teams… but it also helps maintain the game’s mechanics. There are some advantages to playing alongside members of your team — stat boosts in the big group boss battles (or “Raids”), a few extra Pokéballs when your team does the most damage in said raids, etc. — and letting people change too much might screw that up a bit. This is the latest in a streak of recent additions meant to fulfill longstanding requests from the playerbase, and perhaps respark the interest of some players who moved on. They added trading (a staple of the main series) in June of last year, and player-vs-player battles (another staple) in December. App Annie says the game is currently the 67th most popular title in the iOS app store. Niantic says the team medallion should roll out on February 26th. Last week we did a deep dive on how Pokémon GO’s new (and long overdue) player-versus-player battle system would work. The only thing we didn’t know at the time was when, exactly, it would actually start rolling out. One catch (but one noted as likely in our initial post) is that it’s not available to everyone right off the bat. As with many of GO’s newer features, it’ll go live for higher-level players first. More specifically, only players who’ve hit the level cap of 40 will get access to PvP immediately, with plans to roll it out to others in the coming days. It’s done like this partly to reward the most dedicated players for their efforts… but it’s also an easy way for them to roll things out gradually to double-check that nothing explodes. Update: Well, that was quick. Within an hour of launch, Niantic has opened PvP to anyone over level 20. Waiting for it to be rolled out to your level? Want a refresher on how it’ll all work while you wait? Here’s our breakdown. Two and a half years after launch, Pokémon GO is at last getting player-versus-player battling. If you’ve already had your fun with GO and moved on, that headline is probably all you need to know — it’s either enough to re-spark your interest, or not. But if you’re still polishing up that Pokédex, hatchin’ eggs and raiding every weekend, you’re probably itching for a few more details. Good news! I got to run through a few battles late last week, and I noted damn near everything that was mentioned. Each player brings three Pokémon into a battle (rather than six, as with the main series). The first trainer to knock out all three of their opponent’s Pokémon wins. Niantic says that 6-on-6 just took too long for a game meant to be played, as the name implies, on the go. If you’re not already friends with a potential opponent, you’ll need to scan a QR code from the other player’s screen to initiate a battle. If you’re ultra friends or best friends, you can battle remotely. Don’t have anyone to battle with? You can also face off against the leaders of the three teams: Blanche (Mystic), Candela (Valor) and Spark (Instinct). The best part of that: training against the gym leaders will earn you points toward the long-frozen Ace Trainer medal (which has been impossible to make progress on since the gym overhaul back in 2017 got rid of training). 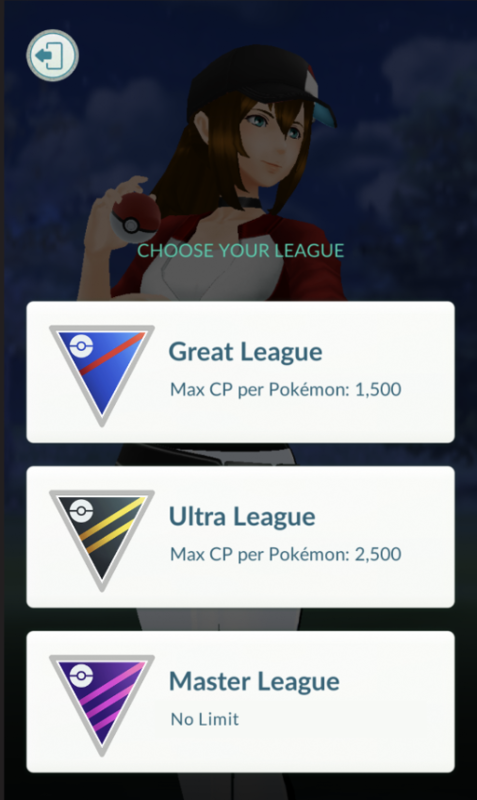 Once a battle is initiated, you choose to battle in one of three leagues, with each league having a different cap on your Pokémon’s Combat Power (or CP): Great League (with a cap of 1,500 CP), Ultra League (2,500 CP) or Master League (no cap). The thinking there: different Pokémon might shine at different strength tiers, which increases the number of “worthwhile” Pokémon. It also lets newer players jump into battling at lower levels, where higher CP Pokémon aren’t on the table. To fast attack, you tap the screen. Unlike gym battles/raids, there is no swiping to dodge. Tapping to fast attack juices up your charge attack. Or, I should say, charge attacks. Plural! Each Pokémon can now have a second charge move permanently unlocked (using stardust/candy). 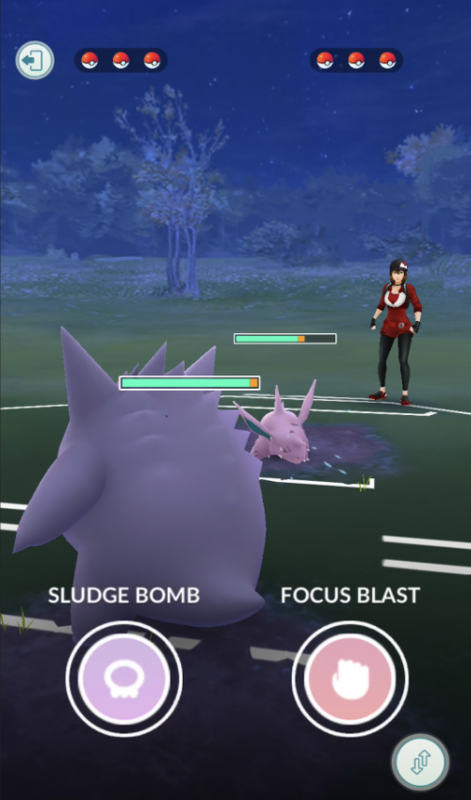 These unlocked charge attacks will also work in raids/gym battles. The new move is picked at random from that Pokémon’s currently available moves at the time of unlock (read: you won’t get a community day exclusive move, or a legacy move, unless Niantic opts to bring them back into the move pool). You can use Charge TMs to change either attack. Matches are timed (thought Niantic hadn’t settled on a match length when I did my test battles). If the time expires and Pokémon are left, the win goes to the player with the most remaining Pokémon and/or the most health. Both winner and loser are rewarded with items; winning does not guarantee better items. Potential rewards include Sinnoh stones, the much-coveted items required to evolve a bunch of recently added Pokémon. Battling the AI team leader trainers will give you rewards once per day. Wins are recorded; losses are not. Niantic repeatedly noted that they didn’t want there to be any reason to not battle someone. Like sending a gift or participating in a raid together, battling a friend counts toward increasing friendship levels. Potions and revives can not be used mid-battle. Meanwhile, damage and knockouts do not impact your Pokémon outside of the battle. The real-world weather will show up in battles, but it’s purely visual; while this may change eventually, Niantic tells me that weather does not have an impact on Pokémon stats in PvP battles at first. As of last week, the only Pokémon you can’t bring into battles are Ditto and Shedinja. For anyone hoping that GO’s eventual battle system would be modeled after the battles of the main series, this… isn’t that. Rather than a turn-by-turn back and forth, battling in GO feels closer to what players might’ve grown accustomed to when taking down a gym or participating in a raid. New mechanics, like the aforementioned protect shields, help to make it feel a bit more strategic and less like blindly tapping the screen until something happens — but after 20-something years of Pokémon games, any changes are bound to be a point of heated debate. With that said (and with the disclaimer that I’ve only had a few battles so far) I’d say I’m… intrigued. It certainly won’t replace the main series battling system in anyone’s heart, but it’s a solid take on a system that works for casual players while still giving them reason to better learn which Pokémon are strong/weak against each other, which move sets are most effective, etc. It’s an intentionally casual battle system for what is an intentionally casual game. Don’t like it enough to take the time to battle a friend? Battle an AI trainer instead, get your rewards, and be done with it. Want to swing the other way and get super into it and become notorious in your neighborhood for being tough to beat? You can do that too, and the gameplay impact is about the same. I appreciate that they’re allowing friends to battle remotely (once they’ve reached the ultra/best friend tiers). It’s a bit of a departure for this game, which generally requires you to be on-location and face-to-face for nearly everything else. But with many Pokémon GO players being new to the series, remote battling lets them get in more battling practice against an actual human than an exclusively in-person system might. As usual, Niantic is being a bit ambiguous about when this’ll roll out, saying only that it’ll roll out “later this month” — which, generally, means as soon as they’re able to flip all the switches, squash the last-minute bugs and get the necessary updates through the App Store. From what I’m hearing, and like many of the recent GO feature releases, I’d expect it to go live for higher-level players first. Before there was Pokémon GO, there was Ingress. It was Niantic’s first game — and while it never became the overwhelmingly popular phenomenon that GO did, it’s undeniably what allowed GO to exist in the first place. Now Niantic is taking another swing at it. The company has rebuilt Ingress from the ground up, with the goal of making it prettier, more immersive and — most importantly — more accessible to new players. The new app will ship for iOS and Android later today. Unfamiliar with Ingress? At its core, it shares its DNA with Pokémon GO; it’s a game that encourages you to walk around the real world, visit nearby landmarks and parks and work together with your self-selected team (or, in Ingress’ terminology, your “faction”). But Ingress is a good bit more… intense than GO (Ingress players like to poke at GO as being “Ingress Lite.”) There are no cutesie monsters to collect or Pokéstops to spin; instead, you’re “hacking” portals (the same real-world locations, mostly, that act as Pokéstops) and “linking” them together in an effort to conquer as much of the map as you can for your faction. Link three portals and everything in-between becomes your team’s turf. It’s like capture the flag mashed up with one massive worldwide game of tug of war, with a bit of Matrix-y cyberpunk dressing slathered on top. Ingress Prime, as version 2.0 is known, replaces the original Ingress app with one built on Unity — the same gaming engine that powers Pokémon GO and many thousands of other games. If you’ve been playing Ingress for a while, many of the changes here are “quality of life”-type tweaks: the UI has been cleaned up, and they’ve added all sorts of shortcuts and gestures to make it faster to do things like attack nearby portals or manage your inventory. The new map interface is easier to pan and zoom around with one hand, with a one-finger control scheme that’ll feel pretty familiar for GO players. The new UI is bound to be a point of contention at first, if only because it means a bit of habit breaking for players who’ve spent hundreds to thousands of hours getting used to the old one, and, well, people don’t like change. Hopefully, they come around. Speaking of those hours spent in Ingress already: Your progress and badges carry over to Ingress Prime. If you’re Level 16 in the original Ingress, you’ll be Level 16 in Ingress Prime. New here, though, is the ability to “recurse.” Sort of like the “prestige” concept made popular by Call of Duty, recursing sets you back to level 1 to start the grind all over again, but with your myriad unlocks (your lifetime AP score, recharge distance and inventory items) still in tow. It’s the players who are new to Ingress, though — or those who gave Ingress a glance before and were spooked away by the steep learning curve — that Niantic seems most interested in here. Whereas the original Ingress just sort of dumped you into the thick of it, Ingress Prime offers a bit more handholding out of the gate. A plot-driven tutorial introduces new players to the concepts of portals, hacking, etc., all while starting to plant the seeds of the game’s backstory and lore. You’re introduced to the two factions and the rival AIs behind them, eventually being asked to choose a side. I ran through a beta build of the game’s onboarding process last week, and, as someone who admittedly fits right into that “gave Ingress a glance and got spooked away” camp mentioned above, Ingress Prime does a much better job of clarifying what the heck is going on. It feels like it could use a bit more play testing (particularly in explaining when I’m doing the wrong thing), but it’s a big step forward. It doesn’t spoon feed you, but it does a much better job of getting the ball rolling. Once they’ve gotten a new player hooked, Niantic intends to go a bit harder with the aforementioned plot/lore this time around. A weekly live-action web series called the “Dunraven Project” will fill in the game’s backstory, while an anime series (which debuted in Japan in October with an English version coming to Netflix in 2019) is meant to explore the wider universe. According to Niantic, Pokémon GO was downloaded nearly a billion times. Ingress, meanwhile, capped out at around 20 million downloads. Will this overhaul get Ingress downloads up into the billions? Probably not. Pokémon GO had that powder keg spark of nostalgia and familiarity to draw in massive crowds right off the bat — but, built on someone else’s intellectual property, there are limitations in what Niantic can do with GO and where GO can… er, go. But by rebooting Ingress, Niantic is using existing IP it already owns/fully controls as a springboard; they’re striving to keep the existing player base happy, while setting it up to grow dramatically by lowering the barrier to entry and expanding the storyline. It’s a tough tightrope act to pull off, but it really seems that they’re starting out on a good foot here. If you’ve been laying off the Pokémon GO for a while due to a lack of new monsters, prepare to be glued to your phone again. Niantic is now adding pokémon from the rugged Sinnoh region that first appeared in 2007’s Diamond, Pearl and Platinum games. Of course, it’s not so simple as a dump of a hundred new ‘mon into your area. The new guys are arriving in waves, likely meaning the most common sorts will start appearing today, while cooler ones and sets of themed critters will arrive over the coming weeks. These are part of the Generation 4 set, but it’s not clear yet which will be appearing first or indeed at all. It’s entirely up to Niantic and you can be sure they’re going to mete out these little guys over several months, interspersed with other events — anything to keep you catching. Everyone will probably have a Chimchar on their shoulder soon, because that sucker is cute, but ultimately everyone is going to want a Dialga. I get the feeling they’re going to be a regular feature at gyms soon. I for one will be working to evolve a Glaceon. There are also some new evolutions, so don’t trash your mid-tier pokémon just yet. Magmortar, Electivire, Tangrowth and Rhyperior mean you’ll have a use for all that extra candy. Update your app and start draining that battery, Trainer! And don’t forget that we’ve got Niantic’s Ross Finman at our AR/VR Session in LA this Thursday. Drop by if you’re in the area. This past Saturday, something pretty weird happened in Pokémon GO: Immediately after the monthly “Community Day” event came to a close, a strange, new, never-before-seen Pokémon showed up. And by “showed up,” I mean it was everywhere. Around the globe, this thing was spawning every few feet. A grey blob with a hex nut for a head; it wasn’t like anything that anyone had seen in-game before. Weirder yet: No one could actually catch it. If you managed to get it to stay in a Pokéball, it would always turn into something else (in most cases, it turned into a Ditto). Just a few hours later, it was mostly gone. Was it just a glitch? Many players assumed that Niantic put this thing in as a placeholder and a glitch brought it into public view. Or did they really just drop an entirely new Pokémon into the game out of nowhere? Three days later, we’ve got an answer: It’s not a glitch. In short: Its name is Meltan, and it’s an upcoming Mythical Pokémon. It all seems to be a big publicity tie-in with the upcoming Let’s Go, Pikachu! and Let’s Go, Eevee! titles that’ll launch on the Switch next month. Based on the limited info we have so far, it seems like to get a Meltan in the new games, you’ll have to catch him in Pokémon GO. This whole stunt was pretty damned clever. Thanks to special, limited-time spawns, Pokémon GO’s Community Day events are when just about anyone who still plays the game will be actively looking at their screen. By sneaking Meltan in there for a bit at the end, they pretty much guaranteed a wave of “WTF?” would roll around the world. All for a little grey blob with a nut on his head. As for how to catch an actual Meltan rather than a Ditto-lookalike: that’s still a mystery. 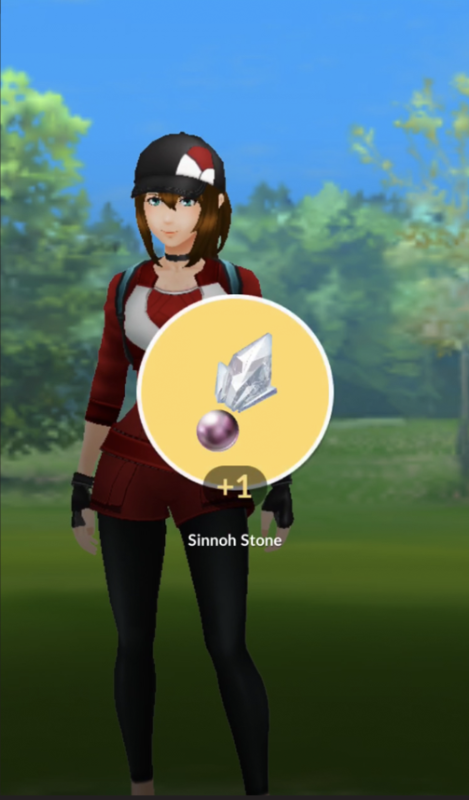 Catching Mythical Pokémon in GO thus far has involved “Special Research” quests — a series of tasks that take a few days or weeks of play to complete. We might be looking at another one of those here.